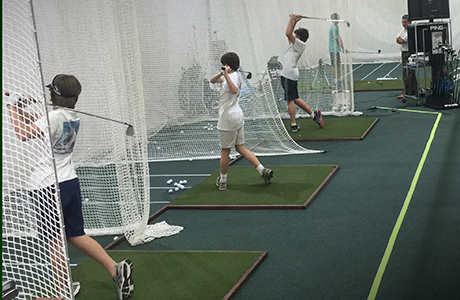 Started in 2000, GolfSmart is Houston's largest premiere indoor golf and trainer facility. We aim to help each individual reach their potential in a fun, safe, and cool environment. Ready to take the next step in you golf game? It starts with one simple phone call — or come by our state-of-the-art facility to see it for yourself. Get away from work for an hour with our Executive Lunch Special. For only $50 you get use of the entire facility including Trackman, Flightscope, Chipping and Putting Green, and our slow motion camera software V1. All this and a box lunch to boot! Learn more or sign up here. Junior Fundamentals Summer Camp! Spend three fun-filled days focusing on the fundamentals. Each day is three hours from 8:30 until 11:30 with a different focus each day, including chipping, putting or full-swing instruction. Also, there are fun competitions with fun prizes for the kids! Learn more or sign up here. We are located in the Calliope Shopping Center one shopping center east of the HEB shopping center. Google maps may direct to the HEB shopping center.